Vocabulary Cartoons works on the principle of mnemonics. A mnemonic is a device that helps you remember something by associating what you are trying to remember with something you already know. A mnemonic device could be in many different forms like; rhymes, songs, pictures to name a few. For example, "Columbus sailed the ocean blue in fourteen hundred ninety-two" is a classic mnemonic rhyme which helps you remember when Columbus discovered America. Following the mnemonic principle of association, Vocabulary Cartoons link together an auditory (rhyming) word association and a visual association in the form of a humorous cartoon. These powerful mnemonics help students retain the meanings of words longer and with less effort than trying to memorize definitions straight out of a dictionary. 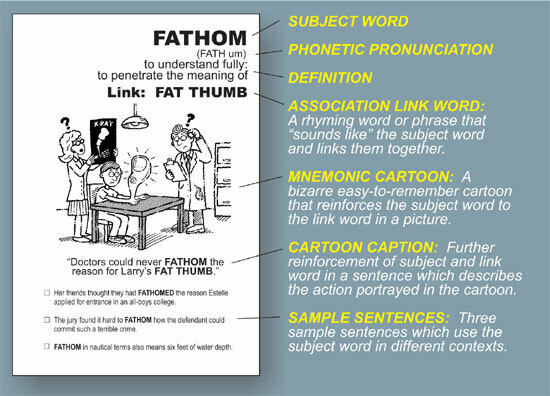 In the example below, the new word FATHOM is associated (linked with) the rhyming word FAT THUMB, which in turn is then presented visually as a humorous cartoon. The more outrageous and bizarre the cartoon, the easier it is to remember.